Ministry of Home Affairs, Intelligence Bureau is the governmental organization which conducts several examination for different field areas. MHA IB ACIO 2019 online application dates are from (yet to be announced) in which the candidates have to be fill up the form and register themselves. 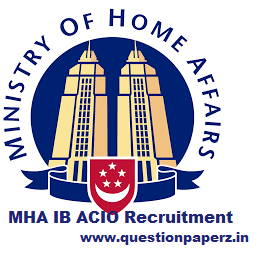 Assistant Central Intelligence Officer Grade- II/ Executive Exam under General Central Service, Group ‘C’ (Non- gazette, Non- Ministerial) is organized by MHA IB and the candidates who all are interested need to fill the application form for the same. The application has to be submitted in online mode only. Below are the details for the recruitment. The different category wise vacancies for ACIO-II are-(Below has been taken reference from past years) for 2019 yet to be announced. Departmental candidates of 40 years of age and have record of 3 years of regular service. For any kind of information regarding to this recruitment, you can write to us in comment section below and we will provide the best of answers in return. Also, refer to the syllabus, previous papers, model papers of MHA ACIO exam and start your preparations for exam. Hi, I couldn’t find the link to apply for this job. There is only one link on site and it is a PDF of it’s advertisement. Please help where I can apply? You can click on Apply Now link given above and register yourself for the exam. Sorry cudnt find the link. Hi, after clearence of paper -I we should attempt paper-II or both papers on the same day we should suppose to write.Please give me clarification. After you attain 33% marks in Tier 1, then only you will be eligible for Tier 2 exam. As there are 4 sections in Tier 1 paper. we have to score 33% marks overall or 33% marks section wise. The cut off is calculated in percentile manner. Kindly download the MHA ACIO Papers from the above given links and start your exam preparations. hi sir..will all the question are in English…how difficult it for a up board candidate.. The questions in paper will be from be from basics and you will be able to answer them. Just stay focused and study well for exam. COuld you please provide link where I can find last 10 year papers or recommend a book to start practising? You can find the respective links given above for books & last papers for practice of exam. Sir mai ba final me hu mere 2 paper ka result aa gya h 2 exam December me hone h so kya mai IB k liye apply kar skti hu. As per the IB ACIO advertisement, the candidates can apply only if you have graduation degree. You can get the previous papers from the above given link for exam. Please try using different browser for applying or try it daily so that you can apply for ACIO exam. It will be online objective type exam. Sir tier-1exam online or offline huata. Descriptive will be online or offline? This information will be given on the question paper. Sir i have eye problem, am i not eligible for this job? While filling up the application form did you find any option on your physical correctness. You can give the written exam, prepare in best way for it and score the highest you can. Hello this will be my first time applying for IB exam. I have some queries here.Along with the e admit they had also informed us that we aren’t suppose to bring the photo copy of admit or I.d card. I didn’t get what they meant by not to bring photo copy of admit. As while printing the admit we will get it in the form of photocopy. Plz comment on it.